Photos by Michelle Davies | The Journal Gazette Customers at Wooden Nickel Records waited in line around 45 minutes to buy vinyl during Saturday’s Record Store Day 2016. Fort Wayne had five stores take part in the annual event. Rex Wegesin looks through the vinyl at Saturday’s Record Store Day 2016 at Wooden Nickel Records on North Anthony Boulevard. 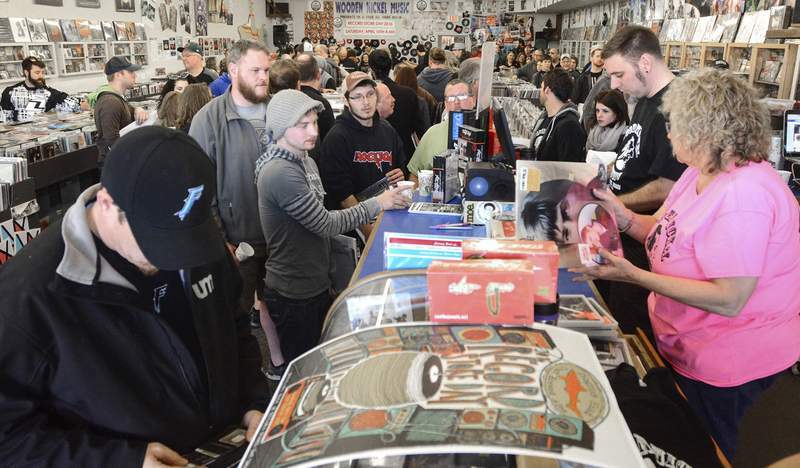 People turned out by the hundreds Saturday morning to mark Record Store Day and buy rare new releases of songs from the 1960s up to the currentday. Five local shops took part in the event, three Wooden Nickel record shops, Entourage and Neat Neat Neat. Local radio personality Doc West from ­WXKE-FM counted 227 people in line when the Wooden Nickel shop on North Anthony opened at 8 a.m. Shoppers ranged from old-time rockers who appeared to be in their 60s to teenagers. Among them was Brenda May of Celina, Ohio, who showed up with her daughter to get some of the special releases. May’s job was to stand in line to pay for the records her daughter wanted – records by David Bowie, Frank Zappa, the Ramones, the Turtles and others – while she ran to a different Wooden Nickel to look for more. Rex Wegesin, 23, was buying records, about $200 worth. He prefers vinyl because he says the sound quality is better and he likes the bigger artwork on full-size albums. "It’s a cool hobby," he said. Record Store Day was conceived of nine years ago and the first one was in 2008. That year, about 140 stores around the country participated and 37 special releases were available in limited numbers. The idea was to do something to attract customers to the stores and try to get young people to give records a try. Record companies had actually quit making vinyl for about 15 years, said Bob Roets, who started Wooden Nickel in 1982. It was very bad for record stores, especially when big-box stores started selling CDs, and most shops died. The Record Store Day effort appears to be working. This year about 1,200 stores around the country took part and record companies produced 350 different special recordings to be released on the day, though only about 300 of each recording were produced. Today records have rebounded, record companies are producing them again, and young people are turning to them, Roets said. 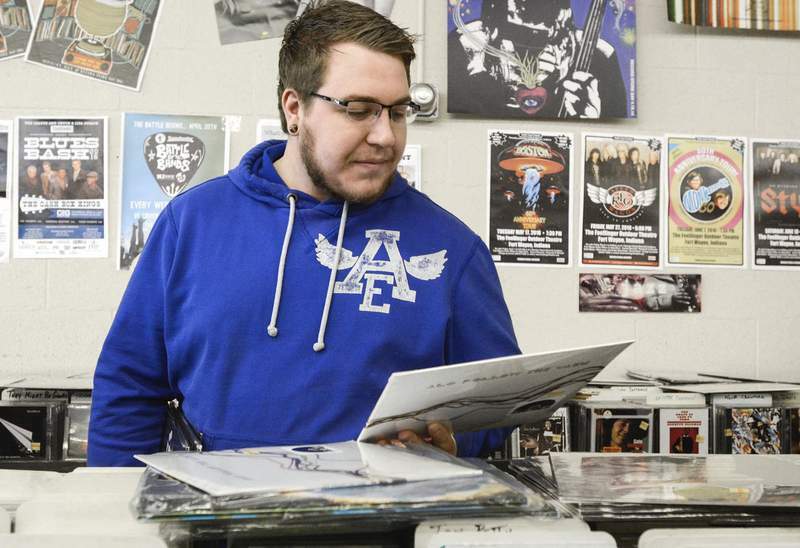 They’re even buying turn­tables, except those are much more affordable today, ­Roets said. "You have to sit and listen" to notice the better sound of vinyl, Roets said. "It’s cool that kids are embracing it. We need young people to keep it alive." But rock ’n’ roll and other kinds of music aren’t going away. Roets said the grandchildren of some of his early customers at Wooden Nickel are coming in today. "Third generation," Roets said, betraying a hint of amazement.